JULY 9, 2001. Afternoon. The Paltan Maidan overflowed with mass gathering. I can vividly remember the day, time and scene. It was a meeting of four party alliance. I was waiting to hear Begum Khaleda Zia, then the opposition leader. Suddenly a great cheer blew up in the gathering; I saw her in her bright white sari with her ever-innocent beautiful sacred appearance stood before mouthpieces. Thousands of people seemed full of breathless excitement to hear from the queen of their hearts. At a time she assured that her party and four party alliance, if voted to power, would make the judiciary independent and separate from executive. This was not just one day's expression. Begum Zia uttered the same thing in her various meetings. It may be noted that in the past Barrister Ishtiaq Ahmed, an adviser to the past caretaker govt., had taken necessary preparation to separate the judiciary. However, he was persuaded by Begum Zia that her govt. would implement it. Thus the present govt came to power strongly pledged, amongst others, separation and independence of the judiciary. But in the last four years after coming to power what it has done is diametrically opposite to its promise. As a matter of fact, govt's reluctance to separate the judiciary was evidently noticed from the very beginning. For the purpose of realization of the Supreme Court's directives under the judgment of Masdar Hossain lawsuit, the govt. began to take time extension, and passed the time effortlessly. mending the Code of Criminal Procedure in the light of directives was the simplest work for the govt. with vast majority in the parliament , but it did not do so. Conversely, it tried to recruit and appoint the judges of the lower courts through 24th BCS bypassing the judgment, which directed that no appointment for the judiciary could be made through PSC. However, following a writ petition the HC made an order, which stayed the process. Consequently, it formed a seven-member Judicial Service Commission, which also was formed allegedly in contravention of SC directives. Soon after that, the govt. appointed 10 additional judges in the High Court Division of the Supreme Court. One of those additional judge was a Law Secretary. This appointment was in violation of the said directives of the Supreme Court. The intention of the govt., however, became more visible when it denied confirming the appointment of the judges of the High Court Division, who were appointed in the previous regime. Some of these judges were really competent and the honourable Chief Justice himself appreciated their contribution and recommended for them, but they were not confirmed only for reasons widely thought to be political. This disrespect for the Chief Justice's recommendation was a serious breach of constitutional convention that created a serious controversy. Controversy again deepened when the govt. appointed some judges in the HC Division whose integrity and competenc were allegedly questionable. However, the govt. reached the climax of its controversy, when one of HC Division judges was reported to obtain forged certificates of academic qualification, and the govt. did not take any appropriate action against the alleged judge. Conversely, contempt petition as brought against those journalists who published the reports. This incident stirred a shock wave amongst public consciousness . Crossing away the purview of lawyers, it rapidly spread among common people. Citizens became anxious thinking that what would be our future if the integrity of such a judge of our highest judiciary remained questionable. And now, the situation is leading to a national frustration. The Judiciary and govt. of the state seem going to be entangled with a serious conflict. Last time when the govt. appealed to the Supreme Court for another time extension ( 21st time) for separation of the Judiciary from the Executive, the court rejected the same, and stayed the hearing of the case until February 1, 2006. What situation may follow henceforward? Apparently, there are two options before the govt. : either it has to take the necessary steps for the implementation of the judgment before the date of next hearing, or it has to face contempt of court. The petitioner of Masder Hossain Case, who had brought the contempt petition almost a year ago, has reportedly said to have submitted some more fresh complaints against the govt. We don't know what will happen next; we do not even want to imagine it. It is however learnt that the govt. is contemplating to a file review petition. But why move review petition? Why any more delay? It is told that actually there remains no ground why the govt. can validate any time extension to do it. It is obvious that if the judiciary was separated, the govt. would loose its control over lower judiciary and magistracy; it could not use them to serve their ulterior motives. Is this the only reason? When a govt. comes to power with overwhelming public support, how can they think of such unfriendly control over judiciary? As a matter of fact, not only the present govt. but also all other previously elected governments have shown a little interest to make the judiciary separate and independent. The Awami League is making a lot of hue and cry against the way the govt's dealing with judiciary, but its previous activities show that it never believes in the independence of judiciary. By 4th amendment it hit out against the Constitution for the first time and it was so severe that it, in a word, buried the independence of judiciary. 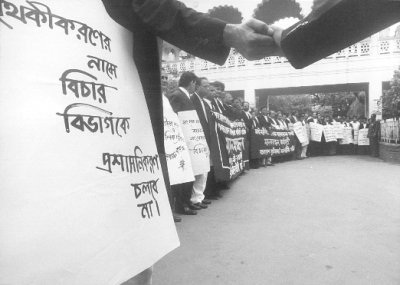 During it's rule from 1996 to 2001, the AL did not take any step to make the judiciary separate; rather despite the directives from the Supreme Court in Masdar Hossain case it spent time in dillydallying. Hence, it may be concluded that the Awami League is also shedding crocodile tears for the independence of judiciary, and nothing more.